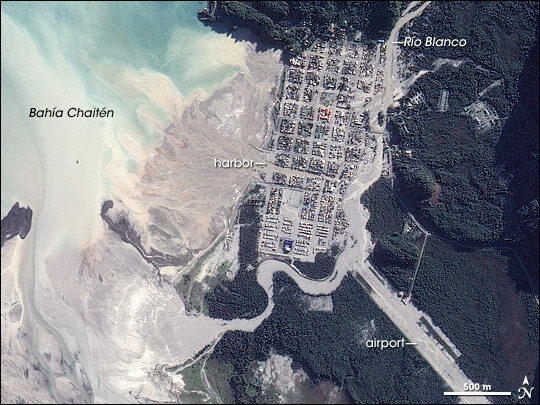 In May 2008, the 4,000 residents of the fishing town of Chaitén were evacuated after the eruption of Chaitén Volcano 10 kilometers (5.4 miles) to the northeast. In addition to the threat of ashfall or an explosive eruption, the town is being flooded as ash and debris from the volcano choke the surrounding rivers. 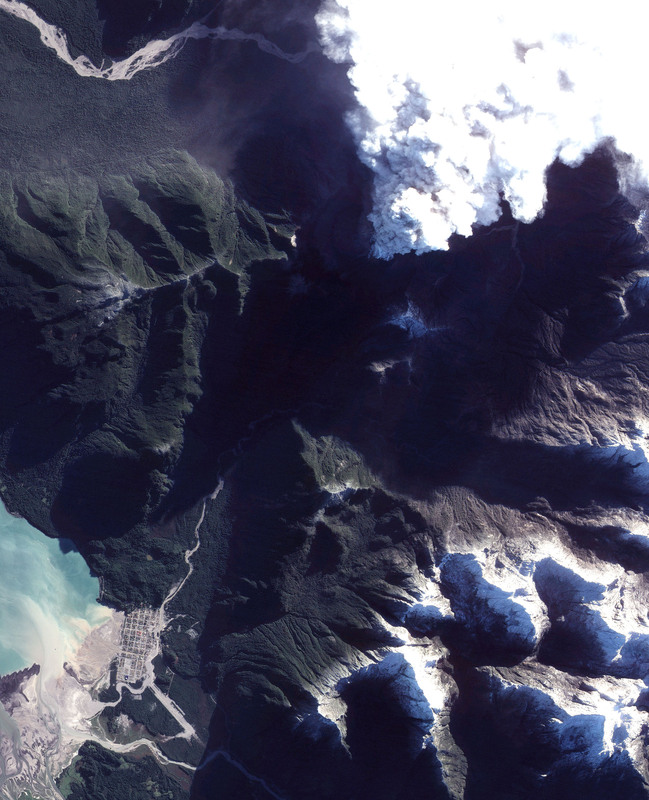 A fresh delta now extends into the the harbor and Bahía Chaitén, once the gateway to Chile’s remote and rugged Palena Province and Pumalín National Park. 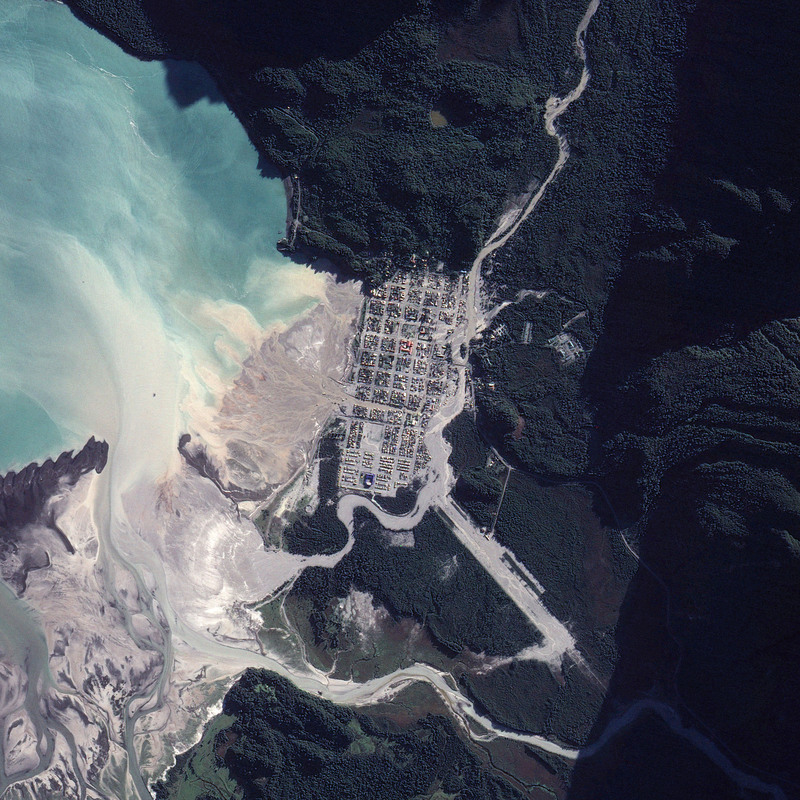 (The size of the delta is exaggerated in this image, which was acquired at or near low tide). Mud also filled the river channel, forcing a slurry of ash and water over the banks of Río Blanco and through the town’s streets. As of May 30, 2008 Chaitén Volcano continues to erupt, steadily spewing a column of ash and steam several kilometers into the air. Simultaneously, Chaiten’s lava dome continues to grow as thick lava emerges from the Earth. Formosat image © 2008 Dr. Cheng-Chien Liu, National Cheng-Kung University, and Dr. An-Ming Wu, National Space Organization, Taiwan. Caption by Robert Simmon.